​Akashiya is an old Japanese calligraphy brush company located in Nara, Japan. 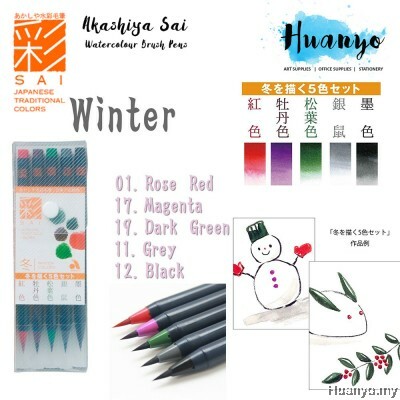 High quality brush pen containing vivid water colour ink. Available in Spring, Summer, Autumn,Winter and Luster and Elegant sets. 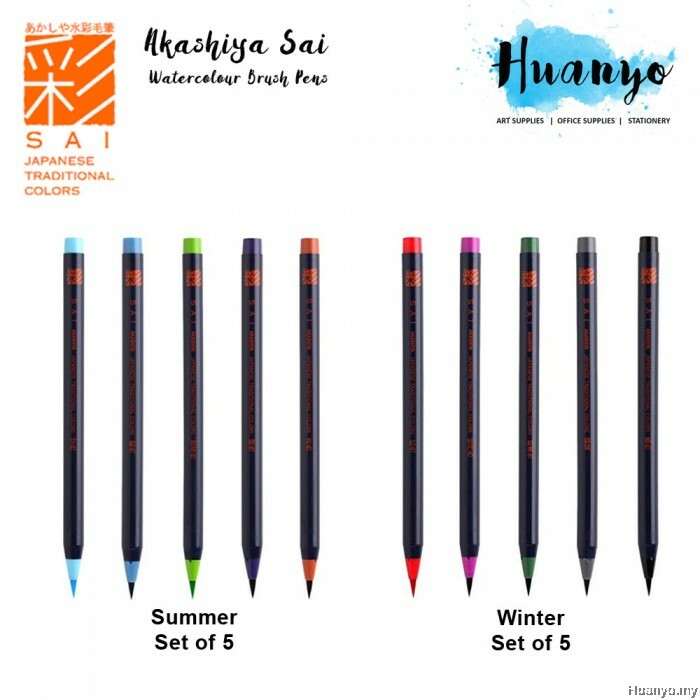 Each set contain 5 brush pens. Spring set colour range : Pink, Madder, Light Orange, Yellow Ochre and Blue Green. kashiya Sai watercolor brush Pen is a perfect watercolor paint tool for drawing illustration, manga, Comics, and for coloring in adult coloring books. Also great for hand lettering, Japanese calligraphy, etc. Soft and flexible brush tip is carefully hand made by skilled craftsmen one by one. By adjusting the amount of pressure applied, you can draw fine line to bold stroke. 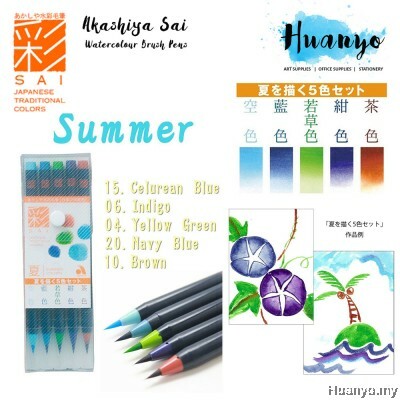 High quality aqueous dye ink used for this art pens are all made at the head factory in Japan. It creates unique vibrant colors as you see in traditional Japanese art. 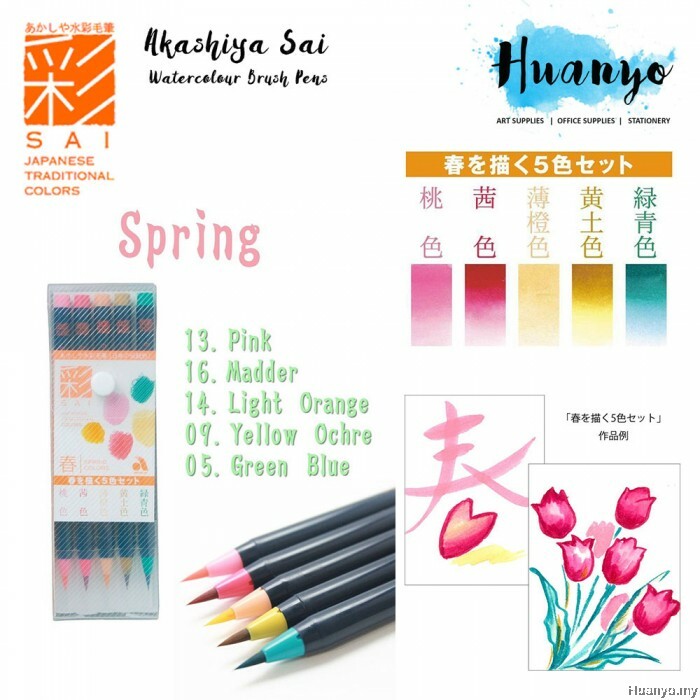 This Japanese fude style brush colored Pen can create a beautiful range of shading and watercolor effect when blended with water. Just simply wet the brush tip with water to thin out the ink or use with a water brush to get a natural contrast and gradation. 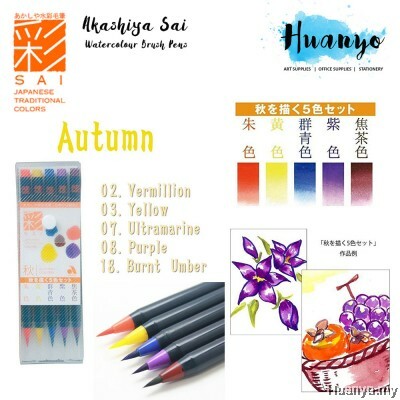 These soft brush paint pens work wonderfully with other drawing media such as pencils, water-resistant art markers or pens to color in the outlines for your Cartoon, manga art, etc.Â_Colors also can be combined with other colors on a palette to create your own new colors. 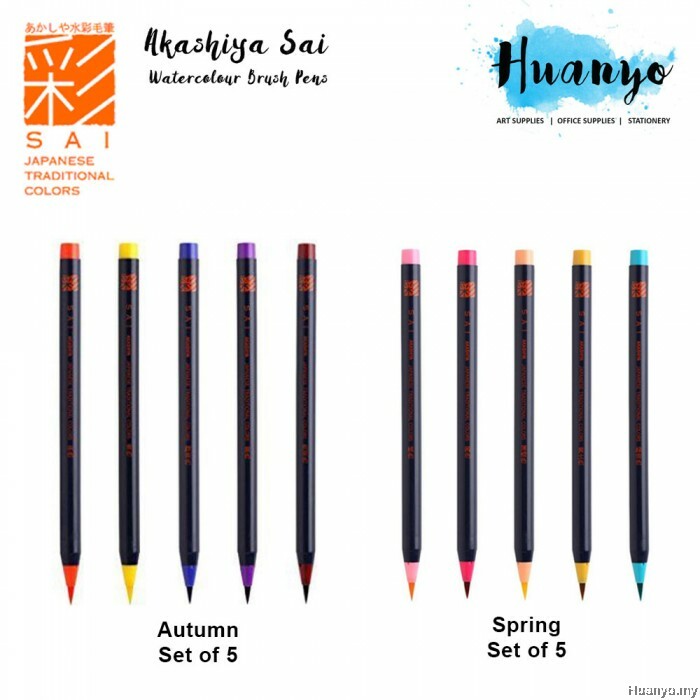 With the genuine feel of calligraphy brushes, Akashiya SAI brush pens will free you to fully express yourself. Dip the brush tip in water and create gently spreading and shading effects! SAI has preserved the very essence of applying both line and color. With the feel of fine calligraphy pens SAI brush pens allow you to move effortlessly between bold and fine lines. With the brush tip dipped in water or with a moistened paper, you can create gently spreading and shading effects. SAI works wonderfully with pencils or water-resistant pens to unleash endless expression possibilities. SAI brushes are the first of its kind to reproduce water-soluble brushes in a self-contained, disposable form. It can be used with a water brush to produce amazing gradients and effects. Colors can be mixed with water to create lighter shades, combined with other colors to create new colors, etc. The brushes are always ready to paint whenever you are, and you can cap them when you are finished. • The innovative design of these SAI brush pens helped it win the 2007 ISOT Stationery of the Year award in Japan. • The colors are water-soluble dyestuff ink. • The Sai Brush Pens are a great combination of traditional sumi-e (Asian art) brush quality and modern brush functionality and portability. 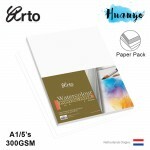 • Do watercolor paintings, sketches, comic style pictures, portraits etc. • It can be used with a water brush to produce amazing gradients and effects. 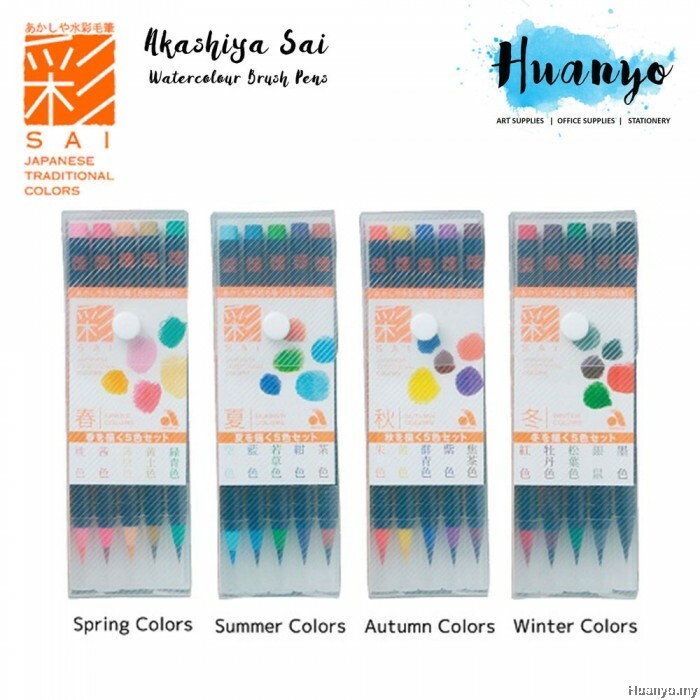 Like many watercolors, the SAI brush colors other than black are not light resistant, so colors will fade if kept in sunny areas. These brushes are perfect for journaling or painting artwork for indoors.